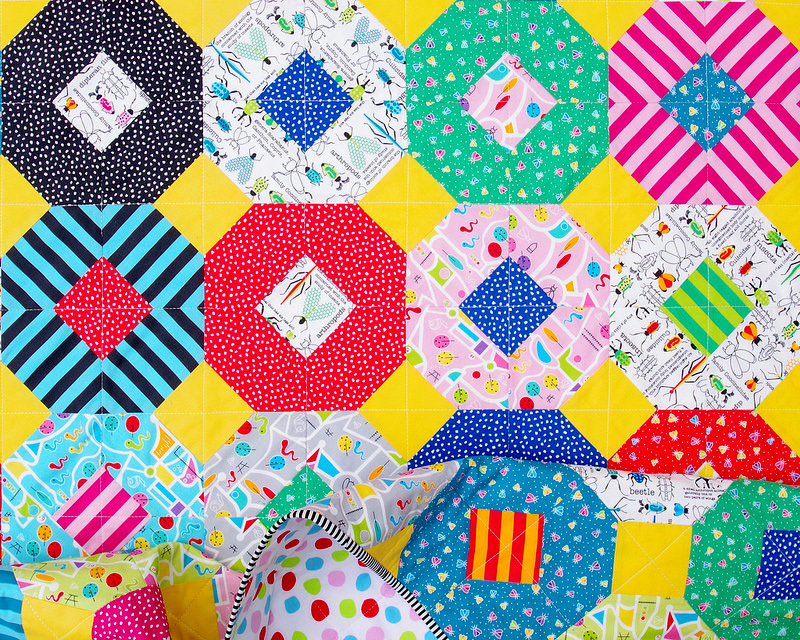 As promised in my Sunday Stash blog post from earlier this this year featuring the Bug City fabric collection, today I am pleased to show you what I did with the FQ bundle that Jodie sent me. 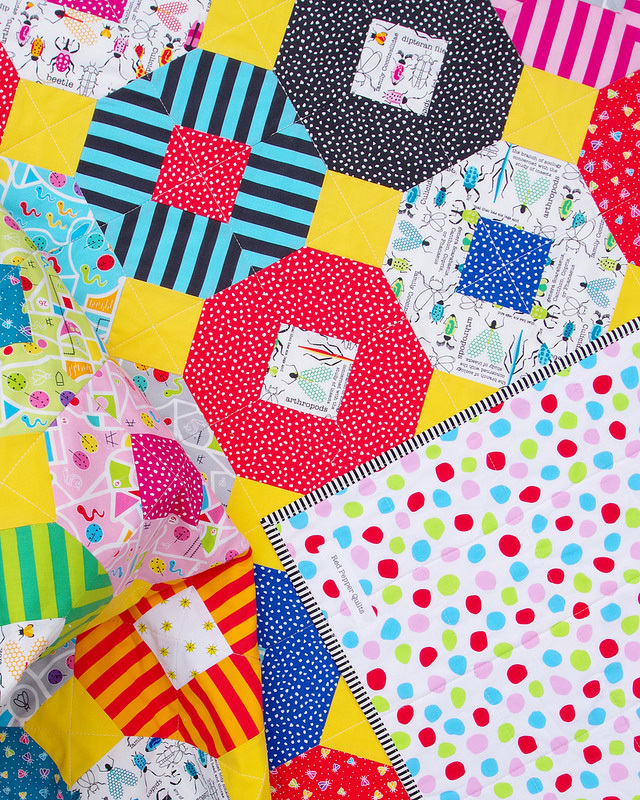 Jodie Carleton (from Vintage RicRac) commissioned me to make a quilt with her brand new fabric line ~ Bug City for Ella Blue Fabrics ~ for her booth at the Melbourne Quilt Market in late November last year. 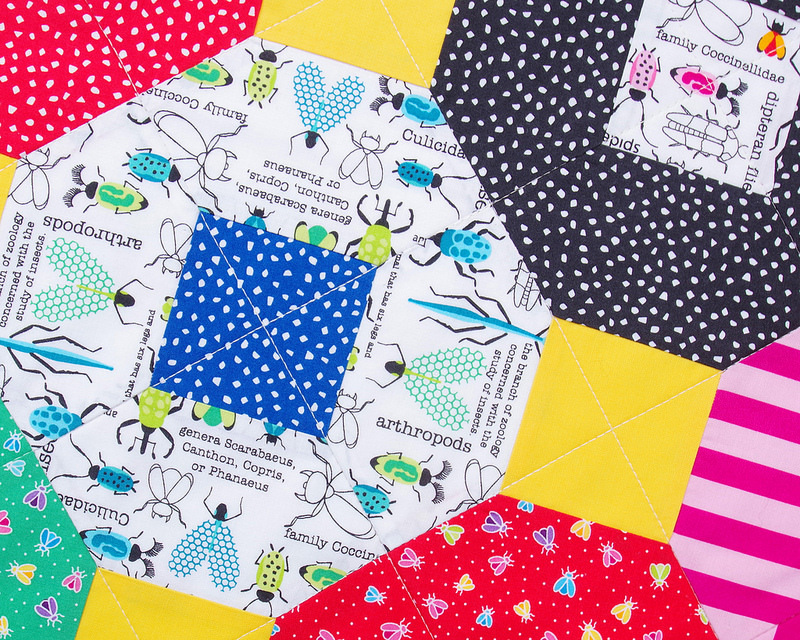 The Bug City fabric collection features five unique designs each in up to five different color ways. The colors are pastel soft with strong contrast elements; vibrant color and strong design elements including the bold (1/2" wide) stripes. 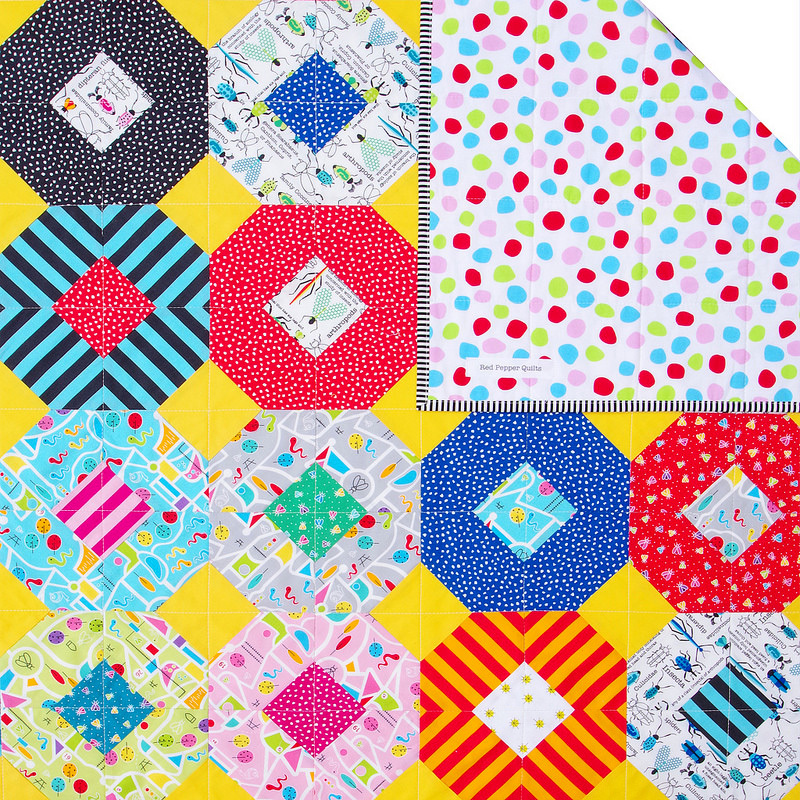 I have used all of the fabrics from the collection in this quilt and I have added a single solid fabric (Robert Kaufman Kona Cotton) in yellow to join the blocks together and as a highlight. Oh my goodness. 💖Those bugs!! 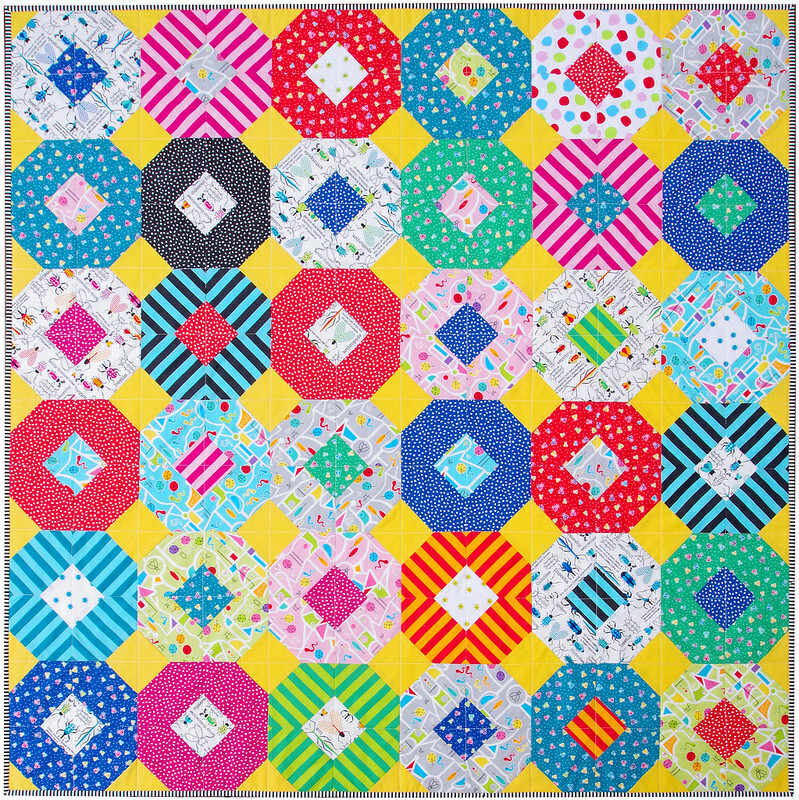 The Kansas Dugout block is one of my favorite traditional quilt designs and the templates (pdf pattern) for this block are available for purchase from my pattern store. 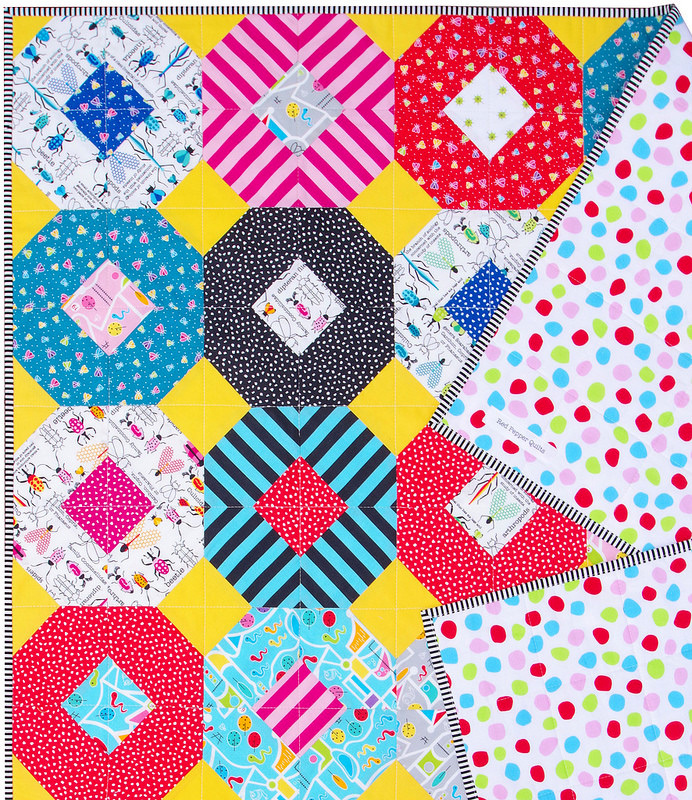 The pattern includes templates for three different size blocks (6 inch, 9 inch, and 12 inch block) and for this quilt I have used the 9" block templates. This is probably a good block size to start with if it is your first time working with inset seams. The templates work best when used in conjunction with the step by step tutorial for the Kansas Dugout Block that is available on my blog here: Kansas Dugout Quilt Block Tutorial. 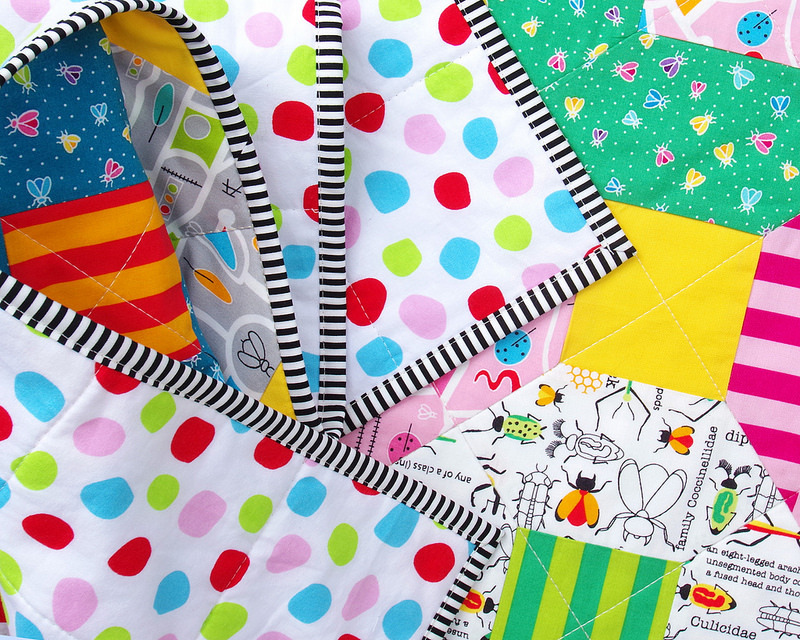 The tutorial will guide you through the process and demystify those often dreaded inset seams. For the back of the quilt I have used a large random dot fabric by Ella Blue Fabrics. 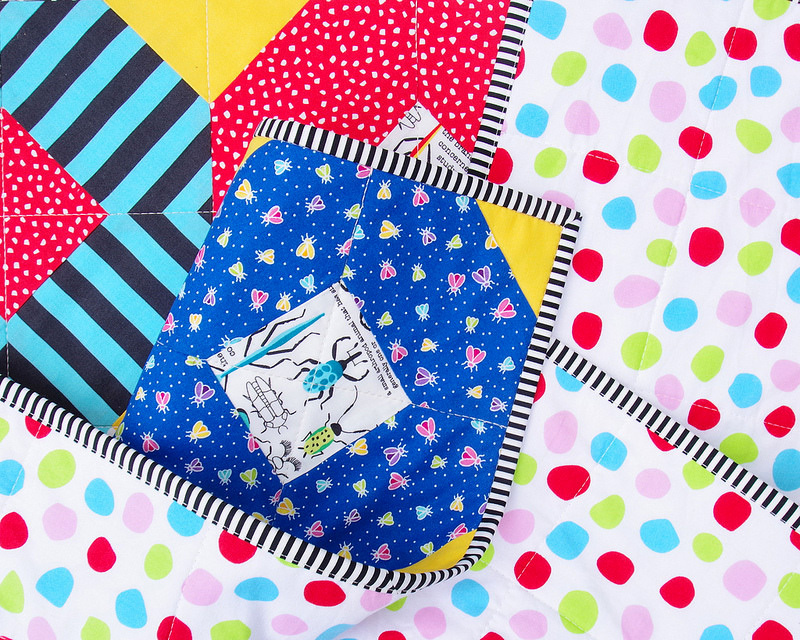 This is a 100% cotton wide back fabric - 106" wide - and perfect for this colorful quilt. And for the binding I have used my signature black/white stripe fabric, this time from the the basics range by Ella Blue Fabrics. The finished quilt measures 54 inches x 54 inches. then adding additional lines through the center of all blocks. With thanks to Jodie and Ella Blue Fabrics for the opportunity to work with them once again. I look forward to seeing what Jodie is up to next! 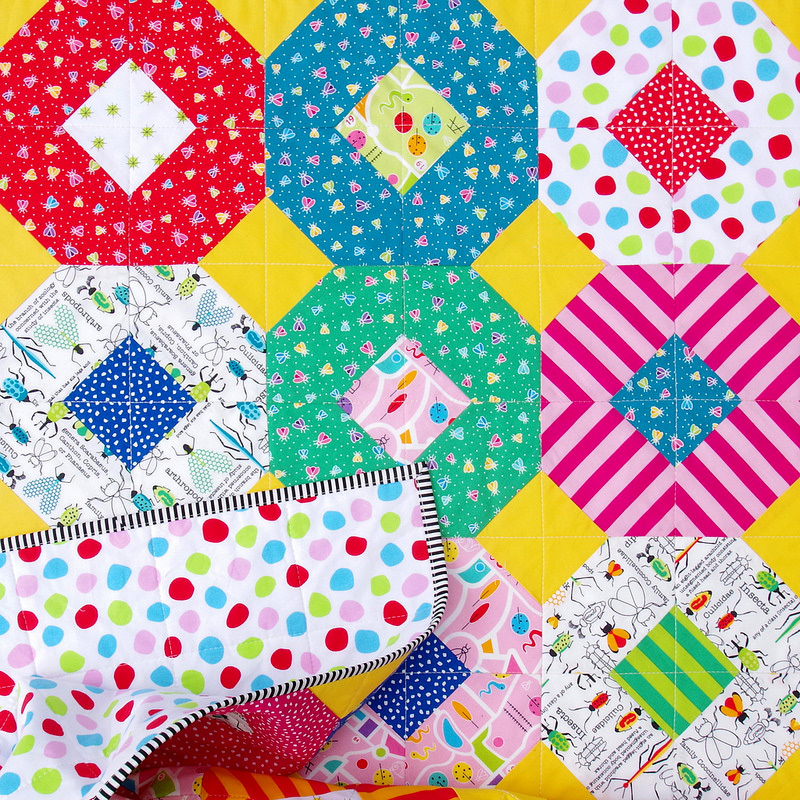 Red Pepper Quilts Pattern Store - Kansas Dugout Templates (pdf pattern). Kansas Dugout Tutorial (Step by step instructions to piece this traditional block with inset seams). Joyful and colourful. 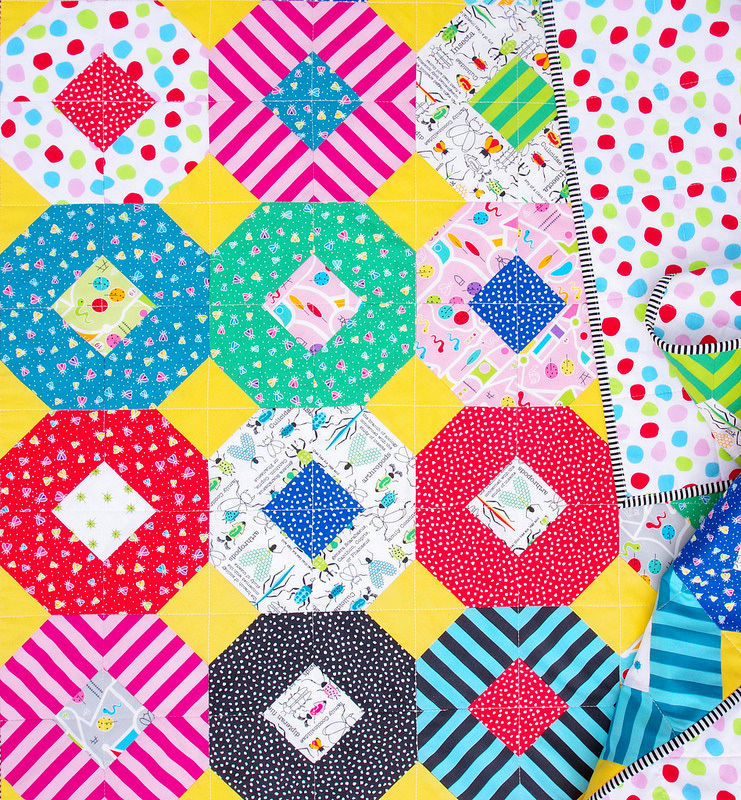 The quilt design is a perfect match for the fabric. Fun, fun, fun! I am going to search around for this fabric locally, first, then online if I have to! It’s delightful! I love all of the fun and bright colors! I love it. 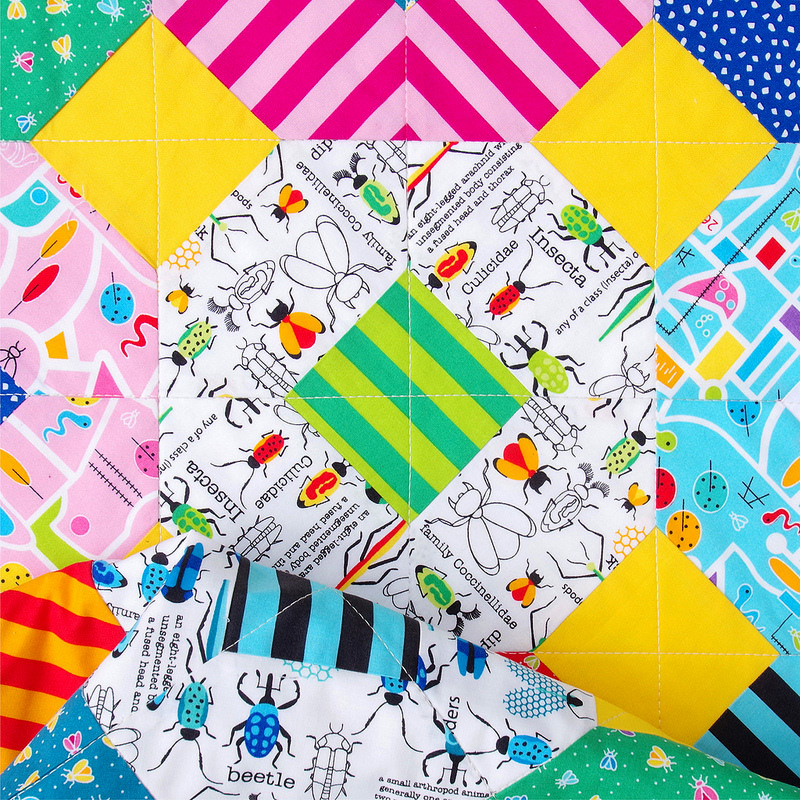 I hate bugs, but this quilt could change my mindset, - help me think of them being all cute and happy.